The What: IDK America will show new ruggedized versions of its IP‐NINJAR family of IP gateway transmitter and receivers at its InfoComm booth, N4524. 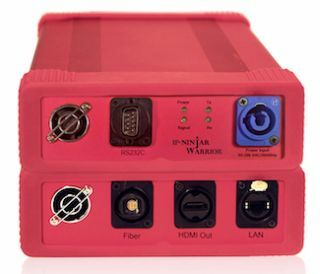 The What Else: IP‐NINJAR is a family of IP gateway transmitter and receiver end devices that provide conversion of HDMI video signals up to 4K resolutions (4:4:4: 60Hz) over a 10G ethernet connection. Controlled by IP‐NINJAR software layer, the new IP system provides a granular way to add IP devices, sources, or destinations, to create a decentralized switching infrastructure. With IP‐NINJAR controlling the gateway devices and the IP fabric, legacy video devices can be utilized as if they were native IP. The result is a hybrid environment that facilitates conversion of video signals between baseband signals (SDI/HDMI), preserving users’ current investment in legacy equipment while enabling them to begin seamlessly integrating newer IP‐based video devices.